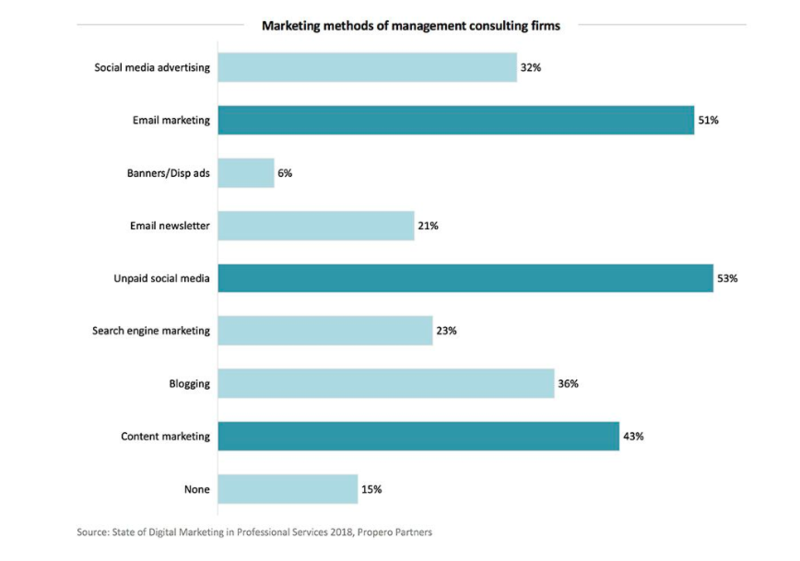 Just like any other industry, consulting is changing faster than ever. Technological transformation and digital disruption are setting the pace for vast changes, but are also redefining what it means to be a consultant. In this article we'll take a look at the future of consulting — what's new in the industry, which trends are happening and how are they changing the field? It's never been easy to define what it means to be a consultant, as the job description has been perpetually changing through the years. The appearance of a recent trend is making this even more confusing, as consulting agencies are increasingly offering services you would normally expect from a digital agency. As consulting firms have aggressively started challenging digital agencies and vice versa, this kind of cross-specialization is blurring the lines between the two while also changing the concept of consulting itself. Part of this is that the scope of what's considered consulting is changing too. If you look at the consulting industry, it's relatively easy to split it up into several tiers. These can come in many shapes and sizes, like a highly skilled general advisory consultant with a proven reputation and high fees to go with it. Someone else might be a consultant that specializes in a certain niche, making them an invaluable expert on that topic. If you look at this segmentation it's easy to see how the job description of being a consultant is becoming increasingly vague. The consulting field has always been split between agencies on the one hand and freelancers on the other, but recent trends indicate that these parties are working together more often than ever. It's hard to find all the people with the right expertise within one company, so firms often look to individual contractors to expand their knowledge on specific topics that are relevant to their client. What challenges are consultants facing today? With a changing market and different ways of thinking about the job, the challenges that consultants face have also changed tremendously. First off, the competition has been heating up. As referred to earlier in this article, the consulting field is changing fast, while expanding what we talk about when we talk about consulting in the process. Take for example micro-consulting — the practice of providing a short burst of work that focuses on one specific topic rather than having a large scope. Some managers prefer this kind of consulting over the traditional firm-based, large-scale approach, and it's making it important for people on both sides of the table to stay on top of their game. Ever since digitalization impacted virtually everything we do in life, at work and in between, there's been a growing need for consultants with related skills. Most of these are related to digital marketing, but it can also be important to know more about innovation, technology and the possibilities that they can bring to companies. When there are this many things to know about, it's important to never stop learning. It's no secret that consultants need to travel a lot. More often than not they're on a plane getting to a client or spending a couple of days on location to get the job done. Unfortunately travel can be a tiring ordeal — especially when you're on the road every other week. There's a lot of room for improvement in how consultants deal with this reality, but advanced digital services can make their lives a lot easier. Take for example travel management platforms, which make it easier to book flights and keep track of all parts of the journey. Make sure to check out our article about how tech is influencing business travel for a closer look at this topic. Nobody is excited to do their expenses — it's boring and time-consuming work that can end up killing your productivity. Unfortunately, consultants are constantly making costs for all kinds of things they can get reimbursed — from flight tickets to hotel stays, at the end of a project they typically end up with loads of receipts. On the bright side, digital platforms have been popping up that offer an effective, simple solution to cut back on the time they spend on this. Travel and expenses can be a hassle — especially when you're working hard to please the clients you're consulting. That's why we built Rydoo, the all-in-one travel and expense management platform. Booking business travel with Rydoo is a breeze. With our beautifully designed interface, it feels just like you're booking a holiday trip. Taking care of your expenses? It couldn't be easier! With smart features like instant approvals by managers and automatic text recognition for receipts you'll be done in no time. Also, actionable insights make it easy for managers to stay on top of all spending so they're able to control budgets when needed. It's easy to get started with Rydoo — just sign up for a free trial and try it for yourself. We'll sure you'll love it.